A Wheelbarrow Full of Style: Weekend OOTD! I had forgotten that I took an OOTD picture whilst I was in Portsmouth. I wore this on the way down as I wanted something comfy but still fairly smart /casual. 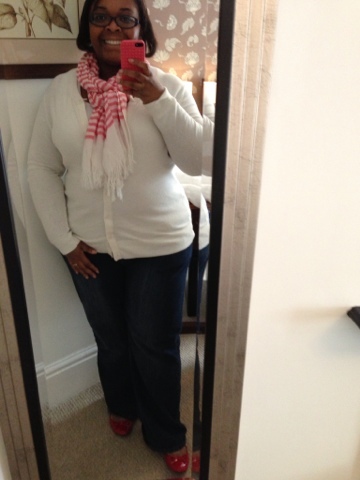 The cardigan is from Gap, scarf from F21, jeans Yours Clothing and my shoes are from Sainsburys! I ended up putting another cardigan over this by the afternoon as it was soooo cold walking by the seafront!